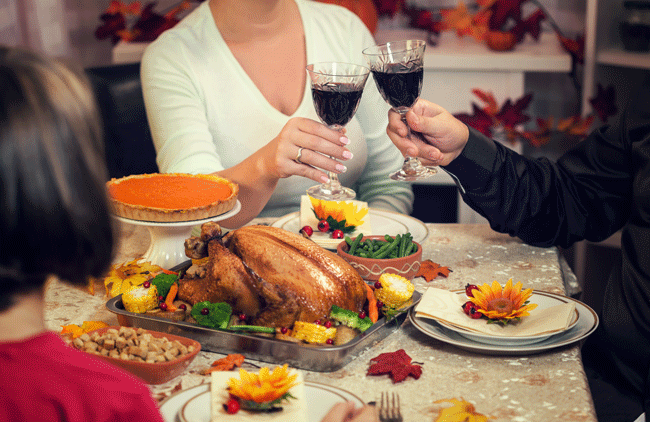 There's no doubt that Thanksgiving is a time of celebration and community; however, it is, for many of us, also a time when we're surrounded by those particular family members (you know who they are) who you only see on major holidays and just can't seem to understand why you're not dating anybody or will continuously ask you when you plan on having kids. Frankly, it can be exhausting and repetitive, and sometimes, you just need something to take the edge off a bit. So, we've put together this Thanksgiving drinking game to help you cope with the sheer amount of craziness that is your family. And hey, they're still family and we love them -- that's why we're drinking. Whenever a family member refers to the turkey as "moist"
Whenever a family member refers to the turkey as "dry"
Happy Thanksgiving, everyone! And good luck.